Not far from our home is one of the best supermercados in town. They have precooked foods, ready-to-cook take-home foods, a dozen different salsas, and a cafeteria-style restaurant. The best part, though, is their meats. They have several different sliced and marinated meats, as well as several different kinds of Mexican chorizo (not to be confused with Spanish chorizo, which is vastly different). These chorizos are to die for. And one version is so spicy, that it seems you could almost die from eating it. It’s that hot. Their delicious chorizo led me to making this appetizer. As an appetizer, the chorizo needed to be wrapped in something, so what better than bacon. Right? But, that’s a lot of saltiness and spice, which needs to be offset by something sweet. Dried figs or dates. In this case, dates were easier to get, so I went with those. The result is a nice combination of sweet and salty. Plus, they’re really easy to make. Gently cook your chorizo sausages in a fry pan until done. Remove from the pan and place on paper towels to blot up the oil. Refrigerate. Wipe out the fry pan and return it to the stove. If you’re using thick bacon, cook it over low heat until about ½ to ¾ cooked (in your estimation). Blot on paper towels and allow to cool enough to handle. While the bacon is cooling, slice the chorizo into lengths for wrapping. I used 1.5 inches, but you can go with more or less, depending on the length of the dates and width of the bacon slices. 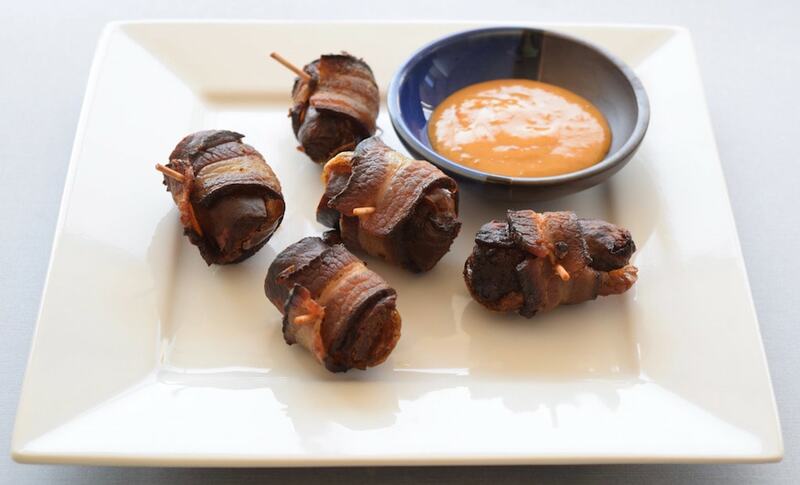 With the bacon cooled, press a length of chorizo together with a date or half-date and wrap with the bacon. 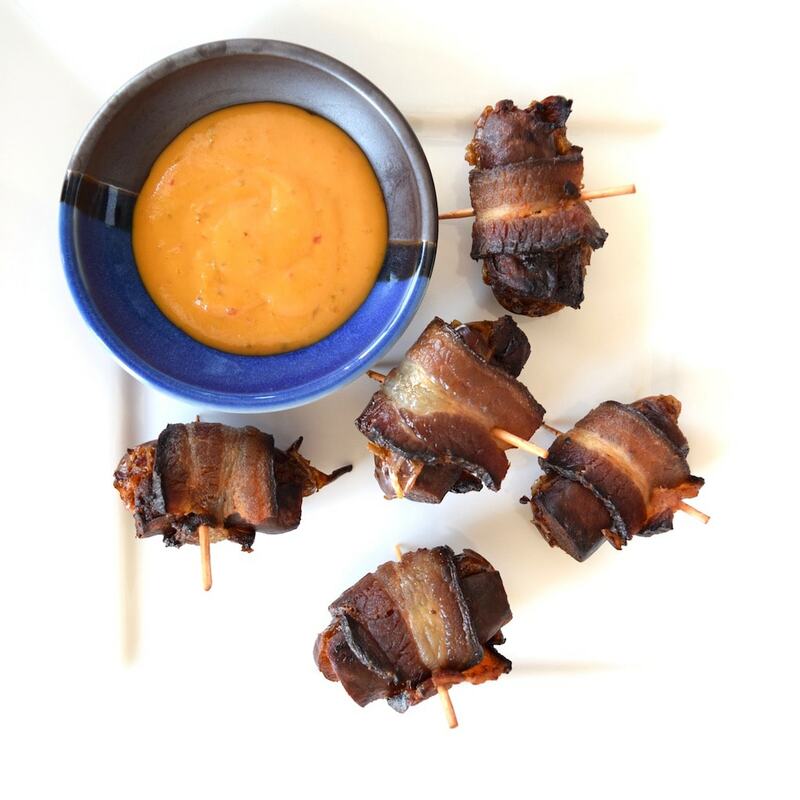 Skewer the bacon ends together and pierce the entire wrap (as in the photos). Line a baking pan with aluminum foil and put a grate on it. Place the wraps on the grate and cook in a 375-degree oven until the bacon has cooked through. This took about 5 minutes in our oven with convection enabled. Serve hot, fresh out of the oven.